From black bears to bison, cougars to wolves, this book is perfect for anyone who spends time in the outdoors or lives in rural areas. 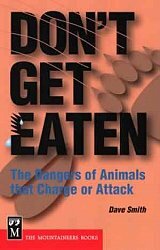 Don't Get Eaten: The Dangers of Animals that Charge or Attack will teach you how to avoid confrontations, and will help you understand the warning signs of potentially dangerous animals, and characteristics like their strength and speed. Learn the symptoms of rabies and, most importantly, what to do if something goes wrong.